Little Wonder’s Enlightening Preschool provides an environment where families can expect their children to be safe, well cared for, treated with respect and given the opportunity to learn and grow. We promote self-esteem, self-confidence and respect for others as well themselves. Little Wonders Enlightening Preschool staff Teachers/ Caregivers that have the education and knowledge to understand the different ages and stages, while never forgetting each child is unique. Caregivers that have the education and knowledge to understand the different ages and stages, while never forgetting each child is unique. Your child’s safety is a top priority at Little Wonder’s Enlightening Preschool. Video surveillance cameras are located throughout the Facility in order to insure the safety and security of the children and personnel. 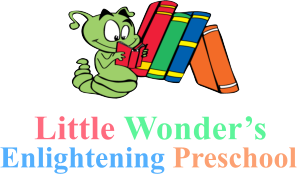 Little Wonder’s Enlightening Preschool is a licensed facility that follows title 22 guidelines, set forth by the state of California.